For Krittika gentlemen, the condition of radiant, romantic, intelligent, creative, idealistic, central, confident, gaming, self-reflexive, pitrikaraka Surya may considerably affect the outcome. Mesha pada 1 represents Surya's empowerment in romance and celebrity entitlements. In the rashi of Champion Mangala, sparkling Surya asserts radiant genius. Typically pada 1 are dramatists, politicians, royalty, celebrity, creative artists, and unique charismatic figures. Vrishabha-pada-2-3-4 express the tension between two-party bargainer Zukra versus one-party autocratic singular Surya. Often the intelligence of pada 2-3-4 is focused into the Values-fulfilling sectors of banking and finance, natural resource conservation, music, wines and perfumes, arts, and beauty. Due to his international cultural fluency, and his skills training in western social sciences, Behari was able to translate esoteric concepts of an older Indic civilization into modern social-psychological vocabulary. He published primarily in English. Thus his Jyotisha viewpoint became accessible to the post-WorldWar-2, English-reading generations. Behari published more than a dozen Jyotisha books in English, most of which are still in print and highly valued today. Esoteric Astrology is widely considered to be the magnum opus of Bepin and Madhuri Behari. Atmakaraka = Surya * parivartamsha yoga of Zukra-Makara -10 with dig-bala Thula-Shani-7 * Behari's extraordinary dual career spanned two demanding professions: traditional Jyotisha, international diplomacy, and industrial development economics. Primarily an economist, Behari was educated at both Patna University and the University of London. He retired from service as a diplomat of the government of India. While simultaneously holding administrative, advising, and executive roles of substantial importance, during the period of India's mid-century industrialization, Behari also maintained a scholarly practice in Jyotisha. His spiritual perspective is distinctively theosophist, and he draws deeply from that belief tradition in his interpretation of esoteric Jyotisha. For some, Behari's theosophical interpretive framework is constricting or even offensive; for others it is liberating. Behari's writings are often deeply reflective, often struggling for clear expression, but praiseworthy for the effort and sometimes shockingly insightful. His economics publications appear to have faded into academic history, but Behari's Jyotisha writings continue to inspire controversy, confusion, appreciation, and debate. The overall nativity is strengthened by the presence of graha in all four corners * kendra.This remarkable pattern applies to BOTH the D-1 and the D-9 varga. uttama-Shani-7 engages the lawful balancing order in matters of high importance to the conduct of public affairs. Indicates consultants to government ministers. Uttama karmapathi Shani occupies the career-driving 10th-from-10th yuvatisthana. This balancing, yoking Shani-yoga guarantees a long and lawful governance career (Shani) in specialties of consulting, advising, diplomacy, relationships (Thula, 7). Powerful and stable career. Longevity in career. High dignity and respect in public life. ultimate ambivalence toward social authority indicated by Ketu in bhava-10. Kuja-Drishti toward bhava-4, bhava-7 and bhava-8 shows a competitive and adversarial quality, of a sporting and masculine nature, in the advising behaviors. Abundant physical energy and a blunt Kuja dosha afflicts Chandra-4, Rahu-4, Shani-7. dig-bala * Shani-Thula * uttama * Sasya Yoga * Shani in bhava-7 Shani's austere adherence to marriage vows keeps the core relationships chaste. Opportunities for challenge and competitive excitement are found within the business partnerships but marriage remains fixed. Yuvatisthana = 10th-from-10th = central to career. Daily interactions and agreement-building consensus with peers form the foundation of professional achievement. A good career must be strong in both bhava-7 and bhava-10. Shani drishti to Chandra produces a hard worker, materialistic, often unable to accept direct physical affection, but appreciative of duty performed, laws abided, and material acquisition. Rahu, Kuja, and Shani affect the Chandra-Rahu pair in bhava-4. Many house-shifts and career-driven changes in dwelling. Yet unshakably dedicated to the perpetuation of ancient (Chandra) folk customs and cultural norms and maintenance of traditional rhythms in the home. Long-term duty and dedication to public service in matters of finance (Vrishabha) indicated by the muted Surya-Shani pair in 6th dazamamza-10 Vrishabha. Bepin Behari commentary Planets in Signs and Houses re: the awkward 6/8 angle produced by vidyapathi-5 Surya-Makara in bhava-10 "You are very ambitious and hard-working. However, you often fail to hit the target, and consequently feel immensely frustrated." Behari was born into a Budha mahadasha due to his Budha-ruled Azlesa Chandra. Therefore his material terra-lifespan did not include a mahadasha of either Guru or Shani. The effects of both of these powerhouse graha must be experienced via drishti upon other graha. Guru joins Kuja in D-10. Kuja period really brought forth the effects of indoctrinator dharmesha-9 Guru, through Jyotisha writing and lecturing. The only graha lying outside the grand square in radix is the most excellent dharmesha-9 -in-9, Guru. since He will not have His own Vimshottari mahadasha, Guru's main contribution is the benefic ray He casts upon Ruchaka-Yoga Mangala. Guru can have a karako bhavo nashto down-side affecting the father. The father may be over-confident of his own knowledge, pompous, or a priest locked into ritual who is unable to see the truth underlying ceremonial religion. Chandra-Mangala yoga via drishti to bhava-4. Financial advantage via competitive energy, innovation, physical movement of Mangala-Mesha plus Chandra-Rahu mixing with those who belong outside the home culture. Kahala Yoga - a strong bandhesha-4 Chandra receiving drishti of a strong karmapathi-10 Shani. Produces extreme stubbornness and rigidity in the home life, but softens the leadership style adding a parental quality. Can be patronizing and rigid yet protective and reliable. Takes leadership roles with conviction that the customary way (4) is best for the social order (10). Not swayed by others due to strong foundations in life (4). Kuja again. Self-defining and overflowing with physical combative energy. Luckily that energy is skillfully but firmly constrained by the uttama-Shani. Result is many challenges and obstacles overcome - some instantly, through heroic action; most slowly and patiently, through maturity and the turning of the wheels of government bureaucracy and time. Jyotisha studies must have provided a healthy outlet for the creative, competitive, individualistic energies of Kuja when the pressures of large, conformist organizations and their internal entropy would begin to weigh heavily on this bright independent thinker. Jyotisha provides the"big picture" view that his Chara square craves, while promising more action than the procedural rules of diplomacy could ever hope to produce. Chattering Kumara ruler of career-profile Navamsha-10 occupies radical 10th in rashi of politically conservative, government-service Makara, suggesting a profession at the highest levels of the social order. parivartamsha Zukra-Makara brings luxury wealth and structural, architectural beauty. The career is complex and diverse, due to bantering Budha's numerous relationships. The Ketu influence is always dispersing, pulverizing, eroding the ego-attachments to material rank or praiseworthy social performance. Ultimately the native's reputation derives more from his spiritual contribution and less from his material status. A straightforward, talented, rule-abiding and steadfast public servant who is a master of policy and planning detail. An administrative economist-by-day yet an esoteric Jyotishi-by-night. Shani-7 in auspicious 9th-from-11th rules vriddhi-bhava-11 Kumbha. One is steadily employed with pragmatic judgment on matters of hierarchy and rank (Shani) and fair contracts (Shani-Thula). Gradually goal-gainful over time (Shani, lente, slow). His materially gainful activity (11) is socially normative (Shani) and regular in its productive pace. "You find that mental acuity, sociability, and comprehension of the deeper principles of nature and society depend on experiences gathered by the soul throughout many incarnations. You work virtuously to acquire knowledge, especially esoteric wisdom, but somehow remain at the periphery of enlightenment. You are very opinionated and cannot be submissive to anyone, as a result of which you fail to make much headway in life." Kuja = independent, innovative, athletic, impulsive, and dominating. Mangala's energetic, invasive effects are felt via drishti in 4-home, 7-marriage, and 8-hidden tantra. Kuja rules 1 and 8. The double effect upon bhava-8 -- Kuja owns and casts His eye there -- suggests a powerful but nicely camouflaged pursuit (Kuja) of the esoteric treasuries. uttama-Shani in bhava-7 protects the marriage. Home life must have been frequently disrupted. Kuja drishti upon Rahu-4 produces impatience with conventional schooling. re: Ketu in professional mana-bhava-10 "You are an idealist, though an unhappy one, uninterested in life." "Personal comforts are taken away; you give these up in order to realize your mission in life. You have tremendous sensitivity, which allows you to establish an immediate rapport with others , but this same quality also makes you suffer emotionally because you sympathize with the masses. You may also display extraordinary skill in the creative arts ." The work ethic is quite distinctive as seen via Budha-yuti-Ketu, Budha-yuti-Zukra, Budha-yuti-Surya all in the professionalized karmasthana. One places duty to the social order above all other obligations. Karma-pathi-10 uttama-Shani public leadership, very much strengthened in kendra-7, suggests very strong leadership roles in government or large corporate hierarchies. Bhava-10 accepts drishti of Rahu and Azlesa Chandra. The total picture is a highly visible distinguished governance career. But, as Behari points out, certain contradictions between the individually positive influences do generate some personal frustration. Kuja in Mithuna in both D-9 navamsha and D-10 dazamamza-10 . Kuja in Mithuna in D-9 = karaka for astrological activities due to Mangala's energy expressing via explanations, descriptions, instructions, diagrams , communications oral and written, transmission of information, media messages, conferences, seminars, trainings. Only in retirement from government career during Kuja mahadasha, did Behari enjoy the "leisure" to begin editing his writings to make them less obscure (as much as possible in any case considering Budha-yuti-Ketu ). In Kuja mahadasha he was energized to negotiate with foreign publishers, and to write new materials, which made his Jyotisha viewpoint internationally known. Clearly Kuja is not a leisurely graha. Mangala is competitive, energized, and ambitious. Despite his advancing age, Behari was vigorously active during the mahadasha of Mangala, producing some of his best Jyotisha work during the final years of the incarnation. Bhagyavahana Yoga = ruler of 9 in 9 while lord of 1 in 1. Relationship between Guru dharmesha-9 and Kuja lagnesha-1 generates Mangala's dynamic power to produce some potent Jyotisha works even after a long and demanding career in public service. At the end of a 40-year service career, most people would have stopped producing books and enjoyed a leisurely retirement. 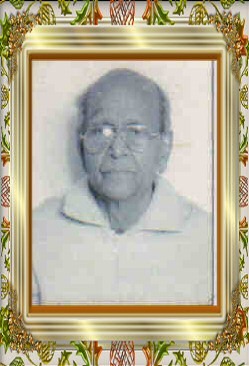 Bepin Behari continued writing Jyotisha books until the day of his death. According to the effect of Rahu-Ketu engaging Chandra, Zukra, Surya and especially Budha, Shri Bepin Behari does things his own way at all times. He does not kowtow to conventionalist piety in his Jyotisha interpretations. Due to his personal integrity arising from strengths of Shani, Guru, and Kuja, there was no need to seek social safety by pandering to the pundits. Rahu Mahadasha brought accolades for valuable cultural-education (4, Chandra) and"roots " proliferation work . Most of the praise came from foreigners (Rahu, mixing) who expressed gratitude for his choice to write in English thereby making his views accessible to a worldwide English-reading audience. Death in Rahu-Chandra period. Soma bandesha-4 = "the end of things ". Behari abandoned his aging body only a few months after his beloved life-partner's decease.